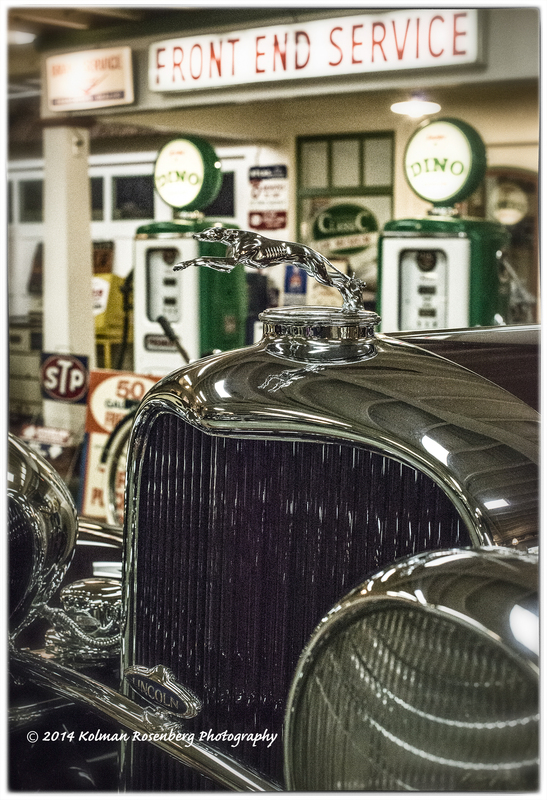 I travelled to Canton, OH on Sunday with fellow photographer Debra Rozin, to visit and shoot at the Canton Classic Car Museum. We went based on a tip that it was worth visiting and after looking at their website I have to admit that I was a bit dubious. The website photos looked like it was small and very tight in terms of closely spaced and roped off autos, being hard to shoot. What a surprise though! It was tightly spaced, but the collection of automobiles, automobile related items and just plain nostalgic items of all sorts was just amazing! The photo above of a clown sitting in a vintage auto caught my eye. It was very colorful but I converted it to black and white and removed some detail with a post processing plug-in called Topaz Simplify. 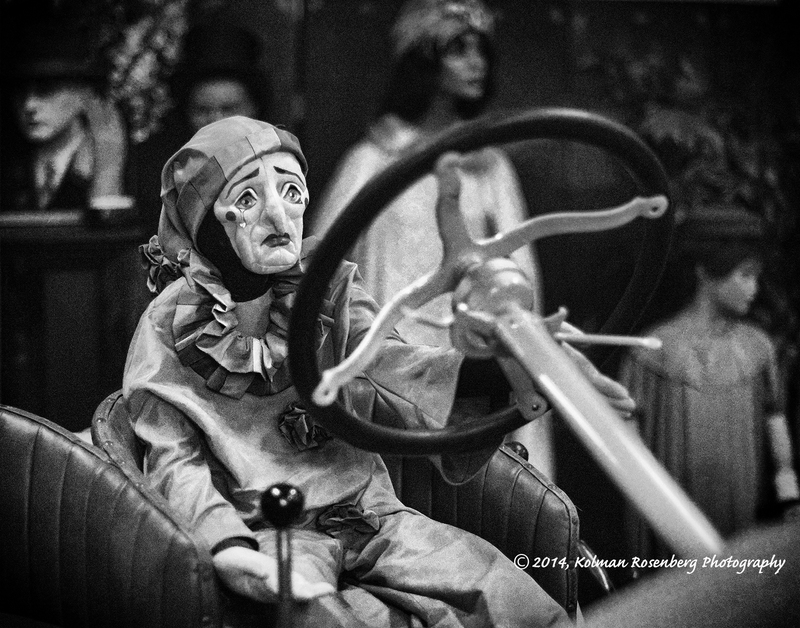 This treatment seemed to emphasize the clown’s expression, which to me seemed to represent the woes of driving in traffic. The second photo, of a vintage Lincoln, was made more interesting by shooting it from an angle that included the mock-up of an old service station behind it. I think it looks like a very authentic old scene. 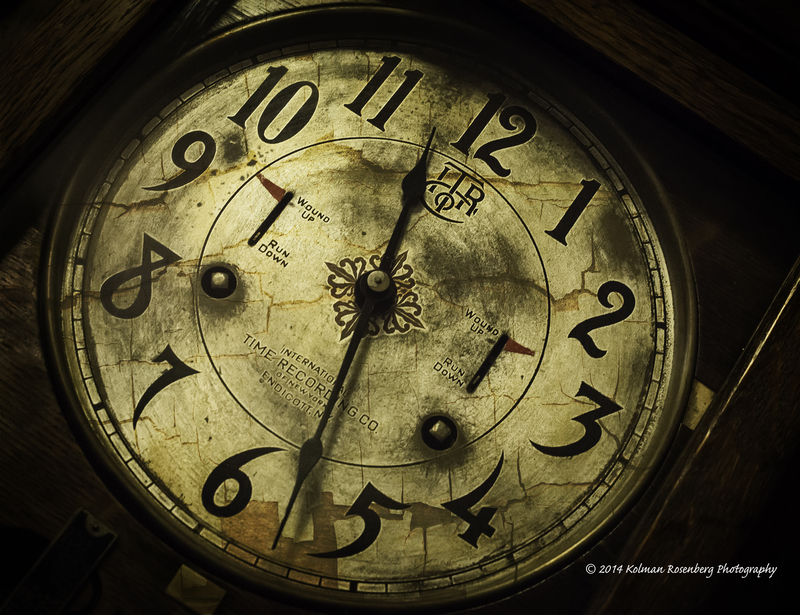 The last photo of the face of an old time clock, was just a portion of a clock that workers punched in and out on at the Timken Bearing Co. in years past. It was quite worn, showed lots of wear and tear and the cracked paint texture was added in post processing to add to it’s interest and aged look. This museum had so much to see that it warrants more trips to Canton. We spent several hours there and in fact when we had gone thru it once, we turned around and went back thru it in the opposite direction just to see what new things we would notice from a different perspective. That paid off with additional photos! Well worth the trip! This entry was posted in Uncategorized and tagged auto, automobile, bearing, canton, classic car museum, Nostalgia, OH, ohio, timken, Vintage. Bookmark the permalink. And, silly me, I just went to the AutoRama on Sunday. They had billions and billions of cars too, as well as trains and planes. Lots of those kinds of opportunities around here Barry!